Great deals on fruit trees while supporting the library! The Winters Friends of the Library will hold the annual Fruit Tree Sale on Saturday, March 7th from 9 am until the trees are sold out. Our annual, very popular, fruit tree sale is back with an added benefit for WFoL members– early entry to the sale! No worries if you are not a member yet, you may join at the door. Arrive early so you have time to purchase your membership before you start shopping. The tree sale will be held in the parking lot on Railroad Avenue in downtown Winters between Baker and Edwards Streets. Bare root trees are $10 each and citrus trees are $25 each. The bare root trees are generously donated by Sierra Gold Nursery, Yuba City and the citrus trees are donated by Four Winds Growers, Winters. 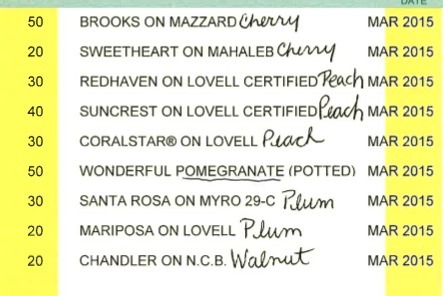 Bare root trees will include cherry, peach, nectarine, plum, almond, pomegranate, apple, and olive. We will have lots of sweet cherries this year. 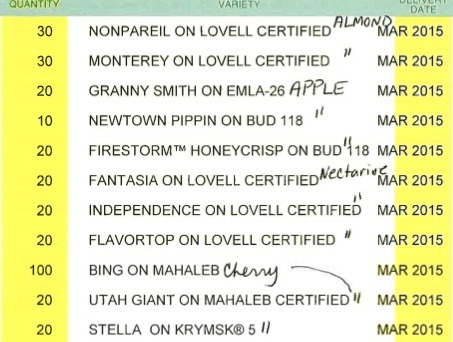 Take a look at the list of trees we are expecting this year. Proceeds from the sale will be used to benefit programs of the Winters Library and to expand the library collections. For more information or to volunteer please call 530-795-3617. Thank you Sierra Gold, Four Winds Growers, and all the volunteers that make this annual means of raising funds for the library and delicious fruit in our community possible.